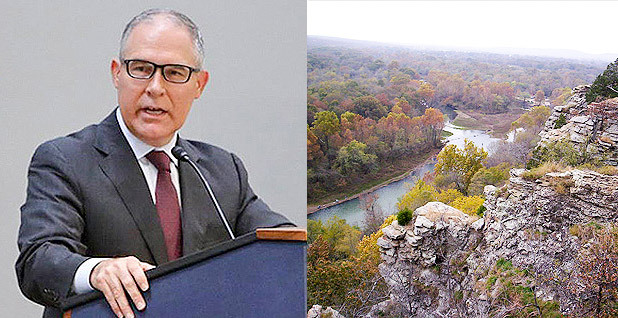 Both critics and supporters of U.S. EPA administrator nominee Scott Pruitt have pointed to his handling of environmental issues surrounding the Illinois River as Oklahoma's Republican attorney general. Photos courtesy of Pruitt via Facebook and the Army Corps of Engineers/Wikipedia. When asked for examples of when he was tough on environmental violations as Oklahoma attorney general, President Trump's top pick to lead U.S. EPA, Scott Pruitt, cites his work on phosphorus pollution in the Illinois River. During his Senate confirmation hearing last month, Pruitt described the 2013 deal with Arkansas to study phosphorus pollution in the river as evidence of his commitment to environmental protection, saying the "historic agreement" he negotiated ensured phosphorus levels in the Illinois River are "now enforceable on both sides of the border for the first time in history." The agreement was the subject of a heated exchange between Pruitt and Sen. Cory Booker (D-N.J.) during the hearing in the Senate Environment and Public Works Committee, and Pruitt has continued to defend his actions in written responses submitted to the committee, which is scheduled to vote on his nomination this morning. But those on the ground in Oklahoma say Pruitt's version of events doesn't square with the deal he actually negotiated. In fact, the 2013 deal Pruitt signed actually circumvented one struck 10 years earlier, delaying the reduction of phosphorus pollution in the river, copies of the documents show. "We already had a phosphorus regulation and agreement that was approved by the Legislature and the governor and the U.S. EPA that, in our opinion, was etched in stone," said Ed Brocksmith of Save the Illinois River, an advocacy group in Tahlequah, Okla. "Pruitt put it up for grabs in a way that was risky and unnecessary." For decades, Oklahoma has been pushing Arkansas to reduce the levels of phosphorus being released into the Illinois River. If too much of the nutrient is released into the river by wastewater treatment plants and poultry farms, it contributes to vegetative growth and depletes dissolved oxygen in the river, reducing water quality and threatening aquatic life. Following two decades of litigation between Arkansas and Oklahoma over whether the Sooner State could require its upstream neighbor to limit phosphorus pollution, which included a trip to the Supreme Court in 1992, the two states came to their first agreement on the matter in 2003. That followed EPA approving Oklahoma's first-ever numeric standards for phosphorus in the 100 miles of scenic Illinois River that travels through eastern Oklahoma, setting levels at 0.37 milligram per liter. To meet those levels, Oklahoma and Arkansas agreed that five major wastewater treatment plants in Arkansas and one in Oklahoma would reduce their phosphorus output to 1 milligram per liter over the next few years. They would then have 10 years to further reduce phosphorus outputs to 0.1 milligram per liter by July 1, 2012. "The state of Arkansas and Oklahoma, acting through their environmental agencies, understand that point source discharges will need time to achieve water quality improvements in the affected watersheds consistent with Oklahoma criterion for total Phosphorus," the agreement states. The deal also set up a protocol for measuring phosphorus in the Illinois River based on a monthly average and describes initiatives Arkansas would undertake to upgrade smaller wastewater treatment plants and prevent litter from poultry farms from polluting the river. At the time, EPA called the commitments "very positive steps toward improving water quality standards." Over the next 10 years, though, Arkansas continued to bristle over the restrictions. In 2009, EPA refused to approve a five-year permit for a wastewater treatment plant in Bentonville, Ark., because it did not include the requisite reduction of phosphorus releases after 2012. EPA officials wrote they believed the reduction was "necessary to protect the water quality of the receiving stream from any discharges" from the plant. The 2013 agreement Pruitt described to the Senate committee came after the deadline for the final phosphorus reduction had passed. Instead of holding Arkansas to its commitment by filing a permit challenge or asking EPA to intervene, Pruitt instead signed a new agreement to delay the phosphorus reduction for three more years while an independent party studied phosphorus levels in the Illinois River. Under that deal, the two states committed to adhere to whatever recommendations the study made regarding in-river phosphorus levels that were more than 0.1 milligram per liter different from the previously agreed-to standard of 0.37 milligram per liter. Unlike the original agreement, the second deal did not include any commitments regarding individual wastewater treatment plants, nor did it specify whether those plants would be required to further reduce their phosphorus outputs once the three-year study was completed. Pruitt has offered multiple reasons for entering into the second agreement. During the Environment and Public Works Committee hearing, he told Booker that he had reached out to then-Arkansas Attorney General Dustin McDaniel (D) to strike a deal because EPA was not moving to enforce the agreement. "There were many in government at the time who said we should wait for the EPA, but I chose a different path," he said. But in Pruitt's written responses to committee questions, he says he pursued the agreement because "Arkansas maintained its objection to the Oklahoma standard" and had threatened to sue the Sooner State. "Rather than protract a now-decades long dispute that appeared to again be headed towards litigation once again, I instead negotiated an agreement whereby Arkansas agreed to be finally bound to the results of a new study," he wrote. A Pruitt spokesman did not respond for requests for comment on the Illinois River agreement, saying Pruitt would not answer questions while the confirmation process is ongoing. He instead referred questions to Pruitt's written testimony and a letter McDaniel sent to senators in support of Pruitt's nomination. That letter offers a third explanation for the agreement, with McDaniel writing that he, not Pruitt, initiated the 2013 negotiations. "I approached Attorney General Pruitt to ask if we could reach a solution that would protect the environment and demonstrate to our citizens that we were committed to working together on their behalf," the letter says. No matter how the agreement came about, environmentalists say they are unhappy with the results. Baylor University researchers concluded a study of the Illinois River in December and recommended in-river phosphorus standards consistent with what Oklahoma had set more than a decade ago. That means the two states will now be tied to using that standard. However, the study recommends the states use different methodologies to monitor the standard. Instead of measuring phosphorus on a 30-day average, as has been practiced since 2002, the Baylor study says phosphorus in the river should be measured on a six-month average, something environmentalists say will make it much more difficult to track whether individual treatment plants are following regulations. Because the two states only agreed to adhere to the numeric phosphorus standards set by the study — and not the methodology for measuring it — Oklahoma and Arkansas are now negotiating which monitoring practices to use going forward, said Oklahoma Water Resources Board Interim Chief of Water Quality Bill Cauthron. Once they do so, he said, the states and EPA will calculate the total maximum daily load of phosphorus allowed on the river and divide it up between the states. Shifting to the Baylor methodology could put the Illinois River at risk, says environmental attorney David Page of the law firm Leach & Sullivan in Duncan, Okla. Page said he believes that instead of negotiating with Arkansas, Pruitt should have pressured EPA to enforce the agreed-upon standards and to move forward with developing a total maximum daily load of phosphorus for the river. "He had a deal and he threw it out the window. He walked away from it and made it worse," Page said. "If he does this representing the people of Oklahoma, imagine what he would do for the people of the United States leading the EPA." Not all Oklahoma environmentalists are upset with Pruitt over the agreement. Ed Fite, former director of the Oklahoma Scenic Rivers Commission and current member of the Water Resources Board, said he believes Pruitt had to negotiate. He notes that the relationship between Oklahoma and Arkansas became strained in 2005 when Pruitt's predecessor, then-Attorney General Drew Edmondson (D), sued major Arkansas poultry producers for contaminating the Illinois River with phosphorus. Arguments in that case ended in 2010, and Fite says nerves were still raw in Arkansas by the time the 2012 deadline came along. "Arkansas' sabers were rattling, and you could just tell this was going to end up in yet again another lawsuit," he said. Fite argues that the three-year delay Pruitt agreed to was worthwhile to avoid more litigation. "It was worth it, it did shorten the process where we were working together instead of everyone lawyering up and nobody talking," he said. But Mark Derichsweiler, a former engineering manager at the Oklahoma Department of Environmental Quality who worked on the Illinois River, says Pruitt didn't consult his team on the 2013 agreement, even though Derichsweiler was heavily involved in drafting the 2002 agreement. The result, he said, "was an obvious effort to sabotage our standard, which had been the basis of all of the improvements that had been made and still need to be made." Derichsweiler noted that while the first agreement included steps the wastewater treatment plants in Arkansas agreed to take to limit phosphorus before and after 2012, the Pruitt agreement does not include any commitment regarding what levels individual wastewater treatment plants will achieve. "There is nothing in there about any treatment plant upgrades or poultry litter, it is all just second-guessing of the water quality standard," he said. That point is one Booker hammered Pruitt on during the confirmation hearing, arguing that Pruitt's agreement was far less protective than the 2002 version. "I pulled that 2013 agreement and read it, and it was stunning to see that it actually didn't take any steps to reduce pollution," Booker said. "It only proposes another unnecessary case study and suspended compliance with the standard."